This is me. No doubt about it. And, with my publishing contract came deadlines, and the re-write for Together Apart. In all fairness, it wasn’t loads. I’ve added a few new scenes and tidied things up a little, but the deadlines were fairly tight – and it probably felt even more so because of me being almost on the other side of the world in one of the most chilled out places imaginable. Instead of doing a little bit each day, I left it until the day before the deadline for me to send the edits back. They weren’t problematic, or exceptionally difficult, and I thought I’d be able to handle that in no time at all. Except, it it wasn’t that easy. If you haven’t read Together Apart, it’s about a break-up. A fairly messy one at that, and when I wrote the majority of it, I was breaking up from a very long term relationship. I’m so far away from that now and I didn’t bank on how hard it would be to put myself back into that headspace. My editor, the lovely Sophie, was asking for more emotion here, more reaction there, and it was an uphill struggle to put myself back into that place of heartbreak and uncertainty. I knew as soon as I started writing it that I should have left myself more time. In the end, the changes were made and Sophie loved them, and now, Together Apart is well and truly done and dusted. I’ve had a few days to recharge before the imminent arrival of the edits for Heart Shaped Bruise come into my inbox and this time I won’t make the same mistake. The truth is, Heart Shaped Bruise as it stands is fresh out of my mind, and I’m expecting MAJOR rewirtes to be done. I bumped into a friend yesterday who’s a freelance photographer, and we were talking about the balance between socialising and enjoying life, and knuckling down to work. And, actually, I think the move from being a self-published author to having to deal with deadlines etc imposed by someone else will work so much better for me. I’ve always worked better with a bit of applied pressure, and the truth is, if you’re self-publishing, you have to be super disciplined to stick to your own deadlines. There’s far too much slippage in there for me. Yeah, it meant sitting in front of the computer for nine hours straight on New Years Eve and almost making myself cross eyed, but it was totally worth it. 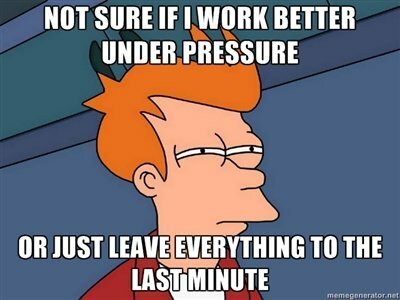 Pressure? Procrastination is an evil thing! Get panicking, you can do it!